Internet has become the most widely used tool of today. Millions of people have online accounts on countless websites. Maintaining separate passwords on different sites is not feasible, and people often use the same password for different sites. Keeping same passwords can make anyone vulnerable to password theft. You may unknowingly post your password to some phishing websites and it is possible that the password also matches to that of another account of yours that contains important and sensitive data. PwdHash is a small program that generates site-specific hash values for the same password so that your password remains protected from phishing websites. 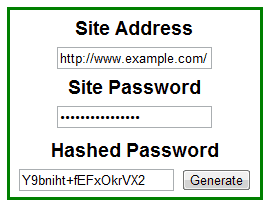 A hash is a randomly generated string that is created from a unique combination of the website and the password.The same password will have different values depending on the website. PwdHash replaces meaningful passwords with their corresponding hash values. Now, if you save this string as your password, it becomes a really good password as it is a random combination of characters. This keeps your single password safe from theft as the actual password remains concealed. The PwdHash website has an embedded password hash generator which generates site specific unique hash values based on the given password. Just input the intended website and your password, and save the generated hash as the new password for that website. Every time you login to the website just generate the password again and paste it in the website’s login form. The hash generated for your password for a particular website is unique and constant. Think of it as encryption of your password using a key that is the website. Alternatively, PwdHash also has a browser extension for Firefox which has been further ported to Chrome and Opera too. The browser extension automatically converts your password to its equivalent site specific hash value when the password is preceded by “@@” or F2. You can then apply the hash to login to your account. PwdHash uses an innovative method to protect your password from theft and at the same time, use the same password everywhere. The benefit is you only need to remember a single password but actually you are having different passwords for every online account. Try out the PwdHash generator in the link below. You can also install the browser add-ons and stay secured from password thefts.